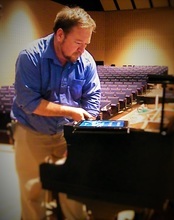 We tune the best piano... YOURS! No phone tag with online scheduling! Book your tuning now! Combining technology with artistic attention to quality, Tickled Ivories brings craftsmanship in piano service to your instrument at a reasonable cost. I tune pianos that other "tooners" pass on, I give your instrument the attention it deserves. Your piano provides entertainment and great memories for you and your family, it doesn't matter to me if you don't have the finest brand of instrument, I want you to have a piano that you can enjoy playing. From antique uprights to spinets to concert grand pianos, I will do my best to keep your instrument at it's highest level of performance. I don't rush through your tuning or repair because it's better to do it right than to do it fast. For over twenty years this has been my policy and will continue to be as long as my ears hold out. Schedule your appointment online by clicking here.